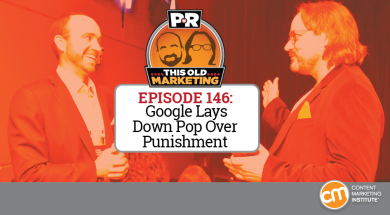 In this episode, Robert and I explore the punitive position Google is taking on the use of intrusive ad units that are impeding the user experience and taking over mobile screens. We also ask a trick question about the future of bad advertising and discuss whether or not YouTube’s new Backstage service will give it a hall pass to play with the big boys. Rants and raves include a focus on numbers and some thoughts on what may be killing marketing automation before its time. We wrap up with an example of the week from Bloomingdale’s. Google to punish sites that use intrusive pop-over ads (06:20): Google has announced that it will be taking punitive steps against websites that rely on pop-ups and takeover ads that visually obscure users’ desired content. As reported in Ars Technica, Google wants search results to favor sites that have the best information and the least annoying advertisements that cover up that information. While we see the move as being a big benefit for users — and an even bigger boon for Google — content marketers should be alarmed by its potential to take away a significant source of publishing revenue. Ads are bad, and also terrible (16:23): A recent column on TechCrunch hammers home the point that bad ads and bad ad tactics — like pop-overs, pop-unders, supercookies, and click-bait — are exacerbating consumers hatred of advertising, which is hastening the industry’s ultimate demise. While Robert argues that the problem isn’t that people hate ads but, rather, that they have become immune to them, he does feel the article highlights the critical need for marketers to evolve their monetization models, and to get better at creating things that consumers actually want to pay attention to. YouTube’s ‘Backstage’ plan to bring photos, polls, and text to its service (26:55): Amid increased competition from Facebook, Snapchat, and Twitter, YouTube is developing a feature — internally called Backstage — where users will be able to share photos, polls, links, text posts, and videos with their subscribers, as reported in VentureBeat. We explain why we feel the move is a reimagining of YouTube comments as a fan-engagement platform, and how it may bring more value to the subscriber relationships formed on the channel. ON24: Webinars have become the single most important marketing tool to generate leads and drive new business, but are you happy with the performance of your webinars? A few best practices can make the difference between a huge success and a waste of time and resources. 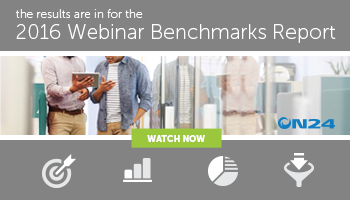 ON24’s 2016 Webinar Benchmarks Report highlights data from over 12,000 webinars that will help you understand the latest trends in webinar marketing. Watch it on-demand today. Robert’s rave No 1: Our friend, and CMW 2016 keynoter, Mitch Joel posted a scathing rant on Medium, in which he takes email marketers to task for squandering the power of marketing automation tools on passive-aggressive drip campaigns and blast attacks on consumers’ inboxes. Robert begs content marketers who are guilty of this practice to start learning the right ways to use automation to connect with consumers. Robert’s rave No. 2: Robert also holds this McKinsey article in high esteem for how clearly it outlines the importance of the customer journey and the advantages of creating experiences that will move people through those journeys in interesting ways. There’s a lot here to explore, and Robert encourages marketers to give it a read — despite the publication’s horrible use of clip art. Joe’s rave: I am currently reading a book called Shoe Dog, which explores the entrepreneurial journey of Nike founder Phil Knight. In it, Knight talks about his fierce respect for numbers because they are a true, objective reflection of your performance — nothing more, nothing less. His discussion should serve as a reminder to us all that, qualitatively, we may love our content marketing efforts and feel they are working; but in the end, the only thing that really matters is the quantitative story that our numbers tell about their value. Bloomingdale’s: In 2005, Bloomingdale’s was looking to take its loyalty credit card program to the next level. The company decided to eschew the direct-mail tactics of the time in favor of creating a publication tailored to the interests of those who live lifestyles of luxury. Named after its iconic, “brown bag” shopping satchels, the upscale retailer’s Little Brown Book is only delivered to its highest-value clientele, rewarding their loyalty with exclusive extras, like private meet-and-greets with designers, opera tickets, and premium products. As this profile in Folio reveals, the primary objective Bloomingdale’s had for the magazine was focused on engagement, rather than on directly trying to drive increased sales. 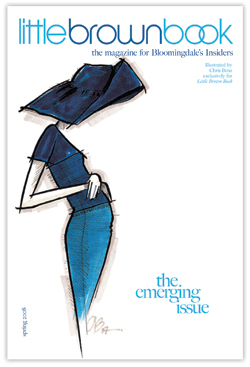 Not only was it conceived as a way to break through the high-volume clutter of mailings its highest-spending customers typically received, but each cover is still illustrated by the designer whose product is featured as an exclusive offer in that issue — both of which make it an enduring example of niche content marketing at its best.